Many patients need help paying for their surgery, whether it's just the insurance plan's out of pocket requirement, or the entire amount if a patient is paying cash. Patients come from all over the world to see Dr. Ellner and might need help with travel costs. Either way, there are a couple of companies that offer financing programs to Dr. Ellner's patients. Dr. Ellner has no affiliation or financial association with these companies whatsoever - she has merely registered with them as a provider, so her patients can access their programs. Click on the links below to apply online - it's very quick and easy, and the companies give you your answer right away! The information below is provided directly by the lending companies themselves and is not to be interpreted as the personal opinions of Dr. Ellner. Prosper Healthcare Lending is the premier financing company in the bariatric surgery industry. With over $5 Billion funded and over 300,000 loan inquiries serviced through their lenders, this is a name and a program you can trust. When contacting Prosper Lending, you may refer to Dr. Ellner's provider number 009167 for faster service. We are pleased to provide patient financing for bariatric procedures through United Medical Credit. 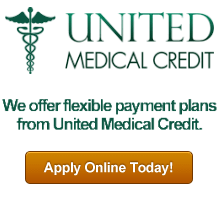 United Medical Credit offers affordable monthly payments, competitive interest rates, multiple financing plans to choose from and many more! You can get more information on their website at United Medical Credit.